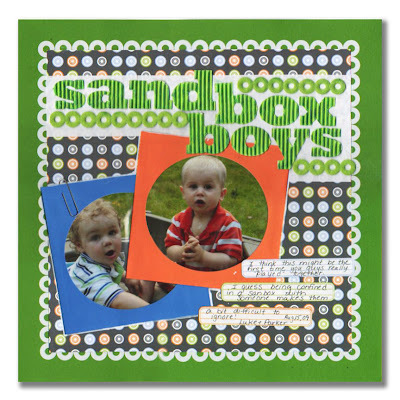 Girl, Paper, Scissors...: Use office supplies on your scrapbook page! You know there are oodles of scrapbook supplies out there for sale that mimic the look of office supplies, so wouldn't it make sense to just go ahead and use... uh...Office supplies?! This week's challenge at Practical Scrappers is to do just that. I used a mix or "real" scrapbook embellishments ( some that look like office supplies) and "real" office supplies. It was a challenge to keep it looking fun, but I'm pleased with the outcome. felt trim: oops I forget! Oh ! Awesome ! I love how it turned out ! The border you made with those reinforcement sticker is really cool ! I knew you could do it ! Such a cute layout, I love Jillibean as well! Great job getting the supplies in there! Very creative! Awesome LO - who would've thought those things could be so cute!! Love how you used the Lil' Buddy papers from Pebbles in your layout and the office supply idea is really clever. TFS.